Well, the creepy bag of flesh in an underground Nazi lab really seems like the sort of thing you shouldn’t go near but hey, you do you, Overlord protagonist. We’ve been hearing for ages about Overlord, Bad Robot’s latest J.J. Abrams-connected movie about zombie-like creatures at the height of World War II, but now we finally have a look at its scare-filled take on what is already one of the deadliest conflicts in human history. 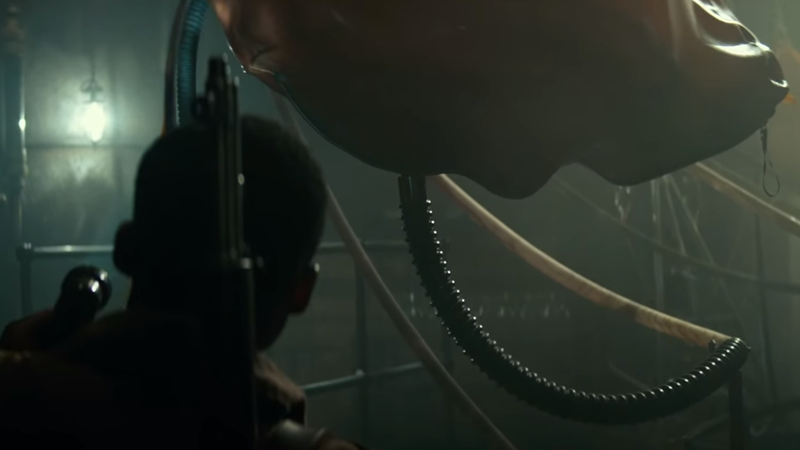 For a movie that was once feverishly linked to the sprawling mess of weirdness that is the Cloverfield franchise—Abrams recorded a message for press at CinemaCon this year vehemently denying any links between Overlord and Cloverfield, but hey, J.J. Abrams would do that, wouldn’t he?—at first glance Overlord doesn’t seem that weird. Well, about as not-weird as a movie about Nazi quasi-zombies could be, that is. In fact, it does kind of just look like a live-action take on that hugely popular Call of Duty mode—tons of action, gory enemies, and lots of creep factor. At any rate, count us in! Overlord is set to hit theaters November 9 in the US. Snowboarding Nazi Zombies Must Die. Again.